Cyclone Idai Overwhelms Mozambique City's Climate Change Preparations : Goats and Soda Beira, a coastal city in Mozambique, had a system in place to protect against flooding. Still, it was destroyed by the cyclone. Mayor Daviz Simango reflects on what went wrong. 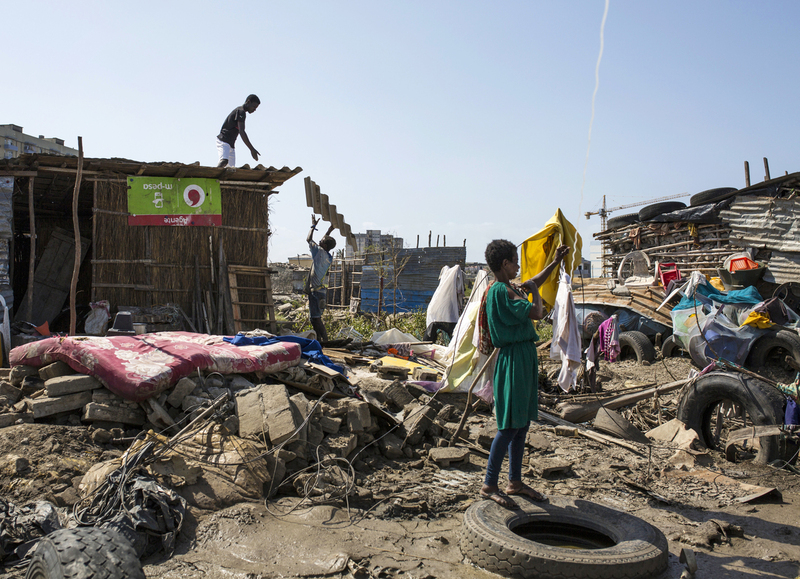 Workers repair the roof of a small shop while a woman hangs clothing to dry among debris in Beira, Mozambique. 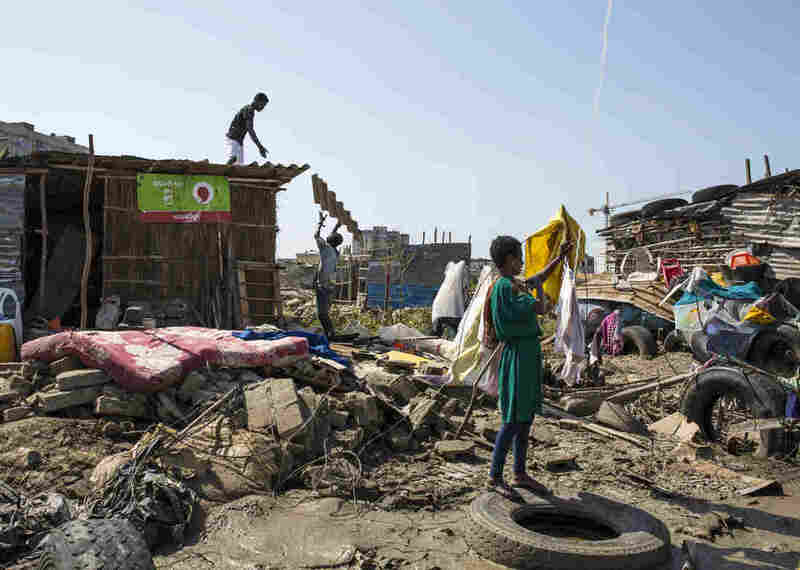 The city was badly damaged after Cyclone Idai hit on March 14. The storm, which slammed into the coast of Mozambique on March 14, was devastating. It claimed at least 847 lives in the region, displaced tens of thousands, and created an inland sea from flooding that measured about 80 miles long and 15 miles wide. Beira was especially affected. The once-bustling port, home to about half a million people, was badly damaged by high winds and flooding. Approximately 90 percent of the city's infrastructure was destroyed by the storm. It raised a question for Simango: why weren't the city's preparations enough? NPR's Ari Shapiro spoke with Simango to discuss the aftermath of the storm and how Beira plans to rebuild. This interview has been edited for length and clarity. 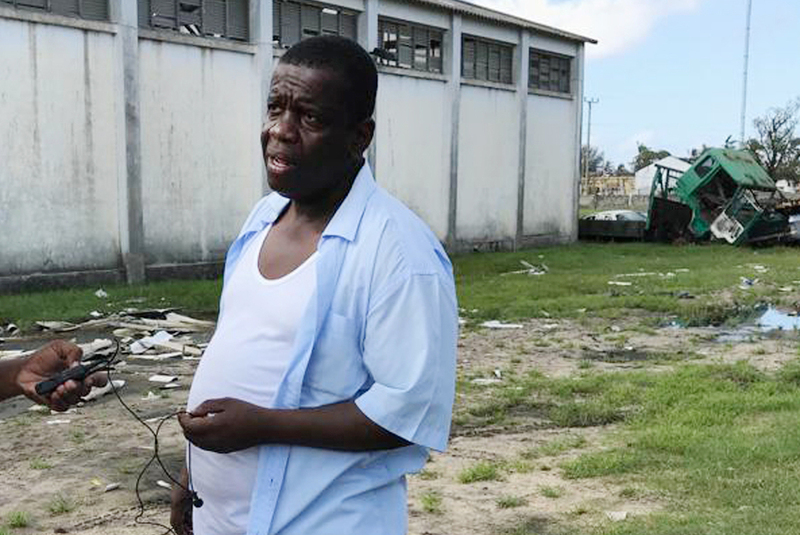 Daviz Simango, mayor of Beira, Mozambique, pauses from directing disaster relief operations in March. How did Cyclone Idai affect Beira? Roofs, houses, schools, hospitals, businesses, were all destroyed by high winds. Our coasts — which have a lot of protective infrastructure like wave breaks and walls — were all destroyed. Roads as well, so many downed trees. We spent a few days without power, no communication, without clean water. It was a really terrible situation. What does your city look like today? Now, we've started to rebuild. Life is coming back to the city. I'm beginning to see people in the street walking, driving. The market is waking, business is ongoing. But [rebuilding] will take a long time. You oversaw the construction of a massive drainage system under the city to prepare for storms like this. Why wasn't that enough to prevent the cyclone from destroying the city? Beira was prepared for the flooding. We have a good drainage system that worked, but we were not prepared for the wind. Wind damaged everything. Most of the buildings here are built to withstand [75 miles-per-hour] winds, but the winds brought by Idai were much higher. What lessons do you take from this? The lesson we take is maybe we have to do better homework. Study how to deal with [multiple aspects of] climate change. We focused on one [aspect] which was flooding. Now we need to think about wind, too. We need to build more resilient houses against wind, and map out vulnerable areas [to inform] where to build and where not to build. What is Beira's most pressing need right now? When you have these kinds of disasters — flooding, raining, wind — at the end of the day you have different types of rubbish. If you keep rubbish and water together, the people will be drinking bad water. We're advising people on the dangers of untreated water. So we need drinking water and sanitation. After that, we need to be clear that mosquitoes will come. We've done well against cholera with vaccinations, but we need to protect ourselves against malaria, too. Is your city getting the support it needs from the international community? So far yes, we've had support from the international community which is playing an important role on the ground. But what will happen if they go? What's going to happen in Beira as we try to rebuild? How are you personally holding up through all of this? I'm a public worker, I have to do my duty. I was elected and the people see me as a leader. I have to use my leadership to deal with everything that's happening here. We're trying our best, and I hope the people remember what we've been doing. It's most important to keep hope and know that together we can rebuild this city. What was it like for you the day the cyclone hit? My grandmom was at the hospital on the 14th. It was flooding in her room so I had to take her out [of the hospital] and bring her somewhere safe. At that time I was worried she'd die in my arms, but she did quite well and she's still living.